In the history of medieval Europe, there were several outstanding women who demonstrated with their activity that, notwithstanding birth or physical weakness, a woman was able to vie with men and take an equally active role in the then predominantly masculine feudal society. Of these women we can mention Joanna I (Giovanna), queen of Naples, who was mostly known for her sale of Avignon, a fiefdom of the Anjou dynasty, to the papal curia in 1348. The Hungarian-born Polish Queen Jadwiga (1374-1399) has had a more lasting effect on history. Her betrothal to a Habsburg was cancelled and she married the Lithuanian Grand Duke Jagiello in 1386, thus becoming a founder of the ruling Jagiellonian dynasty and, what is important in cultural history, she was a major sponsor of the University of Krakow, founded in 1364. An interesting pair are the two Queen Margarets (Margrethes). The first of them, Margaret (Margrethe) Sambiria, or 'Black Margaret', was the widow of King Christopher (Chris-toffer) I of Denmark. As a regent queen she ruled in Denmark from 1259 to 1264. When her son Erik V Klipping became king, Margaret was awarded the title of Domina Estoniae and, as the title indicates, her activity in the third quarter of the 13 century was closely connected with ruling the Danish overseas province of Estonia (Tallinn, in particular). It was at her behest that, in 1262, the Dominicans were granted some land for establishing their monastery in present-day Vene Street devoted herself entirely to religion. In 1344 she went on retreat to Alvastra, one of the best-known Cistercian monasteries. King Magnus had bequeathed her the fort of Vad-stena in central Sweden and she established a monastery there in 1346. She was supported by her confessor, Father Matthias from Alvastra, and two Peters, both learned theologians. Bridget, to whom Christ and the Virgin appeared in visions, considered herself Christ's messenger. Her revelations, which were first set down in Swedish as she did not know enough Latin, were translated and collected by the aforementioned clerics in eight volumes, under the title Revelationes coelestes. After 1350 was declared a holy year in Rome, Bridget left Sweden in 1349 and journeyed to Rome. She never returned to her homeland. While in Italy, she visited most of the local sacred sites, and spent an extended period of time in Naples. Margaret I came to power in 1375, two years after Bridget's death on 23 July, 1373. However, there was a strong affinity between the two, not in the direct physical sense, but in the spiritual sense. First of all, Margaret was inspired by Bridget's ideas, about which she had learned through various channels. Above all, she had known Bridget's daughter Marta Ulfsdotter, who had been an important lady-in-waiting at Akershus Castle, one of the residences of Margaret's father, King Valdemar IV Atterdag. Margaret, who later became Queen, was brought up at the same castle. It should be added that in 1369, Catherine, Bridget's younger daughter, who had stayed in Rome together with her mother for a long period of time, became the first, though not elected, abbess of the famous and influential Vad-stena Abbey in Sweden. She arranged for her mother's remains to be conveyed to Vadstena a couple of months after her death, she was the administrator for the papers connected with the registration of the Brigittines, or the Order of the Most Holy Saviour, from 1375 to 1380, and she made preparations for Bridget's canonisation. After the consecration of Vadstena Abbey in 1384, the first abbess was elected, and she was also related to Bridget and Margaret. The abbess Ingegerd was Bridget's granddaughter and Margaret's companion from Akershus. Although in her lifetime Bridget had repeatedly criticised Valdemar Atterdag and his daughter Margaret, the relationship between Margaret and Vadstena was very close: on Margaret's side for quite pragmatic reasons. To consolidate her power in Sweden, Margaret required the aid of an influential institution or a spiritual centre, for which purpose the enormously popular Vadstena Abbey was highly suited. To realise her ambitions, she needed the support of the two popes who were, at that time, feuding. Bridget served as a smoke screen for Margaret in her dealings with both Pope Urban VI, who resided in Rome, and Pope Clement VII, who was in exile in Avignon. The rise in religious fervour, or more precisely, of the cult of St. Bridget after her canonisation on 7 October, 1391, helped Margaret expand her influence to the eastern shore of the Baltic Sea. According to Paul Johansen, Swedes comprised about 24 per cent of the Tallinn population in the late 14th century. When we take into account the fact that as early as the 13th century the Swedes had settled along the sparsely inhabited (or even uninhabited) coastal areas in the Estonian west and south-west, it was only a matter of time until they spread to the east. When Bridget's miracles occurred, the Swedes inhabited the peninsula of Viimsi near Tallinn, and that is why the site of the future convent was chosen at the mouth of the River Pirita in the vicinity of Tallinn. In 1375 the Swedes from Rohuneeme, by relying on Bridget's 'miraculous help' had already expanded to the east, to the village of Kaber-neeme, where Estonian fishermen lived and founded a new settlement there. On St. John's Day of the same year they hastened to inform the inhabitants of Vadstena Abbey about this miraculous event. Another interesting thing is that, although the Swedes of Viimsi peninsula and the eastern coastal areas lived within the boundaries of Joelahtme Parish, it was not Joelahtme but Oleviste Church that exercised spiritual jurisdiction over them. The legend says that Oleviste (St. Olaf's Church) was founded by the Scandinavians, whose influence continued well into the late 14th century. Of the many Brigittine convents, the mother-house at Vadstena lent most aid to Pirita. But it was not only Vadstena's support that determined the choice of the site, or the foun�dation of the convent itself. The most powerful institution in Old Livonia was the Livonian Order, a branch of the Teutonic Order, which had very close links with the papal curia, but was not unaware of the Scandinavian situation. As the ruler of Gotland from 1398 to 1407, the Order was in competition with Margaret I. Perhaps it was to neutralise Margaret's influence that Grandmaster Konrad von Jungingen supported the claims of the Brigittines in Tallinn and in Gdansk (Danzig), where the first Brigittine monastery, apart from the Italian Paradiso, was founded. It is not out of the question that Jungingen had other supporters in the leadership of the Order. As a result, a suitable piece of land was allocated to the Brigittines at the mouth of the River Pirita, on its slightly higher north�ern bank, so close to the boundaries of the town that even the towers were clearly visible, although outside the town's jurisdiction. The Tallinn magistrate protested vociferously, but the deal was made with the help of the Livonian Order. The place was named after Mary, the patron saint, and became Mariendal (Mary's Valley). Pirita, the corrupted form of Birgitta, came to be used by the Estonians, and both the Convent and the surrounding area are known by that name today. The Livonian Order acted as spokesman for the foundation of the Brigittine convent before the Pope and the Konstanz Council. They also applied to the begrudging magistracy for the first license to quarry limestone and saw to it that land fertile enough to cover the daily needs would fall into the possession of the Convent. Perhaps the Livonian Order had more reason to support them than just religious motives. Otherwise, they would not have gone into lengthy and troublesome discussions with the Tallinn magistracy. The arguments put forward by the magistrates for moving the building further inland were numerous, quite convincing and not easy to re�fute. First of all, the magistracy feared that the Convent would become a bridgehead that could be used for spying or even attacks by enemies. The idea for the foundation of the Convent and its first leaders came from Scandinavia, an active sphere of influence, which was usually hostile to Old Livonian interests. The prospective site for the Convent lay amidst the lands inhabited by the local Swedes, who were in frequent contact with Sweden; in addition both the site and the harbour, whose origins can be traced back to prehistoric times, were too far away to maintain control over. Moreover, there were two monastic houses -a Cistercian convent and a Dominican monastery within the boundaries of the town and it was thought that the donations and bequests of the faithful that were vital for their needs would inevitably be diverted to the rising monastic house outside the town. It is possible that the Livonian Order wanted to use the new monastic settlement, favourably located near a river harbour, in its struggle for power, with the aim of improving its own positions. Hanseatic Tallinn consistently exercised the independence granted to it by the Liibeck rights, thus challenging the rule of the clerics and landlords at Toompea. A similar political agenda might have been behind the actions of the people who were directly responsible for the establishment of the Convent. Information about the three founders and their nine supporters is scarce and confusing. We know more about the three founders, the pious men who abandoned the bustle of this world, and about the large property that they had amassed as merchants. 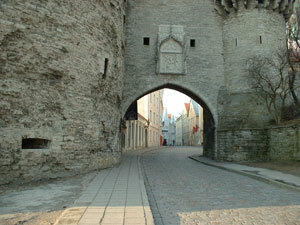 This is described in the travel books written by Adam Olearius, the artist of well-known views of Tallinn. He is the only person to date who was able to read the diary of the Convent in manuscript, which contained a detailed description of the long history of Pirita Convent; this was possible because of his friendship with Dr. J. Vestring, the town syndic. The manuscript, which was miraculously saved after the destruction of the buildings, later disappeared without a trace. The names of the three men were Hinrich Swalbart, Hinrich Huxer ja Gerlach Kruse. In the archival documents of Tallinn which refer to the pre-foundation period, their names were not recorded, and it is quite likely that they belonged to the Livonian Order, which resided on Toompea, either as merchants or favourites. Only then can we understand the generous and unfailing support of the Livonian Order, which the three founders of the Brigittine Convent, unknown in the Hanse�atic town, counted on throughout their mis�sion. The patronage of the Order may also be crucial to understanding the opposition of the town to their enterprise. Hinrich Swalbart seems to have been the most capable of the three, as it was he who lobbied in papal Rome and in the Konstanz Council under complicated political circumstances for the right to establish the Convent. As an able man, Swalbart finally won the trust of the magistracy, who in 1425 sent him as an ambassador to Sweden to settle the matter that posed such vexing problems for the town. He must have known several languages. As a successful merchant, he was charming and skilful at communicating with people. He had probably travelled a great deal and, he must have had some knowledge of mathematical sciences to be able to carry out the tasks of the architect. In those days the planning of a building was based on a symbolic figure, the main elements of composition being a circle, a square and a triangle. By means of a drawing compass it was easy to use them in various combinations. The Grandmaster wrote in his letter: 'Ipse Henricus Schwalberg Architectas fuit dicti Monasterii' ('Henricus Schwalberg himself will be the architect of the said monastery').